Taroudant, Morocco – Bastilla is undoubtedly one of the ultimate manifestations of beauty, refinement and delicacy of Moroccan cuisine. It is prepared for great dinners and wedding ceremonies. Usually, it is served after small plates of fresh salads and before the Tagine with meat. Bastilla is made of fine layers of almost transparent pastry called “warqa” and is stuffed with pigeon and almonds. 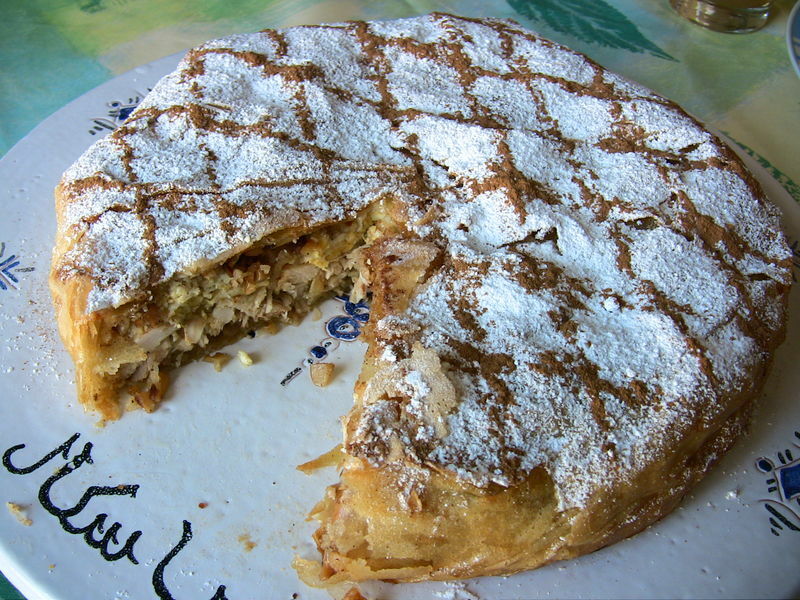 Although there are many famous forms of Bastilla like seafood and ground meat based Bastillas, the most traditional and probably the oldest one is prepared by pigeons, but the latter is often replaced by chicken or other kinds of meat. In this recipe, the chicken can be replaced by the pigeons if desired. Pour the water slowly, stirring constantly. In a blender put the mixture and blend for 1 minute till you get thick dough. Pour a little oil in a pan (which does not stick!) And use a paper towel to spread the oil. 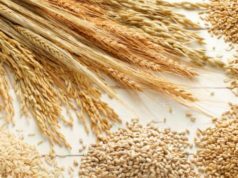 Put in blender and blend all ingredients together until the mixture becomes homogeneous. In a large pot, put the chopped onions in oil (and butter if desired) and add the diced chicken, herbs, sugar, spices. Stir and cook for a few minutes. Cover the pot and when it starts boiling, lower the heat to medium then keep stirring occasionally with a wooden spoon until chicken pieces are cooked and the meat separates easily from the bones. When the chicken is cooked, remove the pieces to a plate and cook the sauce. Whisk the eggs and stir into the sauce and cook in the sauce over a low heat. When the chicken is cold remove meat from bones. In a blender, mix the fried almonds with cinnamon, sugar and orange water. The almonds should be crushed, not powdered. Keep this mixture with almonds in a bowl. Grease the round mold with butter. On the bottom of the dish, place 5 sheets of Bastilla well greased with butter (butter side up) in the overlapping like the petals of a flower and leaving the overflow to the outside edges of the dish (about half of the sheet inside the flat, the other half to the outside). Consolidate the bottom of the Bastilla with 1 or 2 more sheets placed in the centre of the mold. Put a layer of onion sauce, eggs and spices on the sheets using the back of a spoon to spread it perfectly. Put pieces of chicken over the entire surface of the onion sauce in order to completely cover the mold. Add a new sheet and then spread over the crushed almonds. Add another sheet of pastry on top then fold those layers of the Bastilla. Arrange 3 new sheets on top in an overlapping to close it firmly. Once the Bastilla is closed, spread the yolk of an egg on the top. Put the Bastilla in oven preheated to about 45 minutes (more or less depending on oven). Bastilla should be golden brown on its entire surface, the sides and bottom. It has to be crispy. When it is baked, let it for a while (about 5 minutes) then Sprinkle icing sugar over its entire surface and decorate it with cinnamon. Icing sugar and ground cinnamon.